Those of you who know me personally know that I was diagnosed as being deficient in Vitamin D3. Now while some people can get what they need from the sun, I've also had skin cancer twice and had surgery just last year so that's out too. 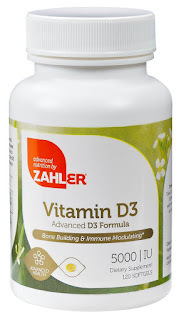 However, I have to have some way of getting what I need so a supplement is what I take and Zahler Vitamin D3 5000IU is easy to swallow and you get 120 soft gels at a very low price. I'm really happy with them so far and since I have to take them anyway, I might as well take something that goes down easy and is affordable too. While I received this item free for an unbiased review, I only review those items with positivity that I actually use and like and this product certainly qualifies. I have used Zahler products in the past and really love the company.